Fig. 18-23. Gas Jet Precession Maneuver Including Nutation Damping from roll angle data to keep the satellite within predetermined roll and yaw deadbands. The system is sensitive to changes in the nutation rate (wheel speed, moments of inertia) and to any change in the magnitude of the jet impulses. Iwens, et al.,  have studied the stability of such a system and suggest that a time delay of about 5/8th nutation period be used between impulses. The control logic is such that when the roll deadband is encountered, a corrective pulse is fired followed by another pulse of the same polarity 5/8th nutation period later, provided that no other deadband activated impulse has been fired during this period. Control Moment Gyroscope. A single-axis control moment gyroscope whose gimbal can rotate about an axis perpendicular to the nominal spin axis can be used for active and semipassive nutation damping for a dual-spin satellite. In active damping, the nutation is sensed by an accelerometer whose output is used to control the gimbal angle. In the semipassive mode, the gimbal is restrained by a torsional spring and dashpot. In this case, the control moment gyroscope may be mounted on either the spinning or the nonspinning component and the stability criterion is the same as that for passive dampers. The damping time constant of such a system, is much smaller than that of a passive system. 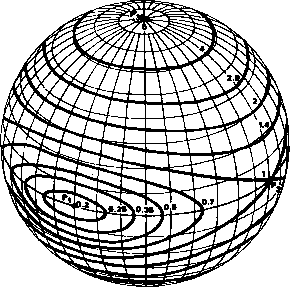 * Except for a small set of moments of inertia corresponding to the Delp region (DeBra and Delp, 1961]. that libration could be damped by the dissipation of energy in a flexible part of a spacecraft. Mobley and Fischell  have suggested a method which utilizes eddy current rods rigidly attached to the spacecraft. Section 18.3 includes a detailed example of libration damping during the GEOS-3 attitude acquisition. Spring Damper. The TRAAC spacecraft used a damper consisting of a spring with a small mass attached to a boom as shown in Fig. 18-24. The spring was released after boom deployment and could expand to about 12 m. As .the spacecraft librated, the spring expanded and contracted, resulting in energy dissipation due to the high structural damping in the spring. This was provided by mechanically soft cadmium which covered the beryllium-copper wire of the spring. The spring was then coated with silver to prevent sublimation of the cadmium in the vacuum of space. This damper is more efficient for removing librations in the orbit plane than for librations in the plane perpendicular to the orbit.